New Updated Sleek Design. Zippered Collar. Lightweight Wicking Fabric. Two Hidden Pockets w/Velcro Closure & Pull Tabs. Mesh Side Panels. 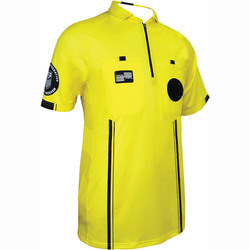 New U.S. Soccer Federation Referee Program Logo Sizes: S, M, L, XL, XXL, XXXL. Add $1.00 for XXL & $2.00 for XXXL.